Changes for 2019 Join Me! It will soon be 2019; it seems like it was just 1999 and the year 2000 was a potential fearful new beginning. However, despite all the hype 1999 rolled into 2000 without a hitch, the World continued to orbit although there have been days I have wanted to scream: “Stop the World, I want to get off!” However, life does not work that way, and the rotation continues. I have experienced many life changes in the past 20 years, and as we head into 2019, I have plans for additional events that will not only allow me to grow but will include many of you. So here is how you can join me on a journey of friendship and love. If you like music and enjoy having company, contact me care of newclevelandradio@gmail.com. Newclevelandradio, LLC., we will plan a house concert for you to host in your home. A house concert is just what you think it is, a concert at your home. You provide us with the type of music you would like to have presented. Guarantee a minimum of $200 (which you can collect through ticket sales.) We will help you do the rest through social media. This is an opportunity to meet performers and host a private event that will enrich your life as well as your guests. Do you have a dream? “If you will it, it is no dream.” Join us for a monthly series: “It’s My Life, I Can’t Do It Alone.” A special thank you to Sheila James , Sheila is my inspiration for starting this series. I have dreamt about who I want to be, and for the last five years I have been taking baby steps in that direction, well now I am taking a giant step, and it’s not just about me, but you too. We will share dreams once a month in a forum where you will get to know me and the people who inspire me. Adding new shows on newclevelandradio.net. We will be encouraging the inspirational people who you will be meeting to continue their stories and share information to help us all follow the path that is best for us. Beginning an Entertainment Series at Vista Springs. This is not just local school or church performers although I look forward to bringing them into Vista Springs to become part of the community, however, in 2019 I will be introducing the community members, staffers, the families as well as all of you to join us for monthly live music/comedy performances at Vista Springs. Music is a universal language and comedy brings out the endorphins for physical and emotional healing. We cannot do it alone, and neither can you! We will create a venue that will provide us with sunshine even on a cloudy, gloomy day here in northeast Ohio. This is the year of positive living; we will touch on topics like healthcare and self-care. Self-care is not always a solo journey, as the name of this series indicates, “It’s My Life, I Can’t Do It Alone,” we will discuss the concept of asking for help and aiding another. My journey is not unlike the one you may be traveling, however, let me guide you, and please feel free to guide me as well. Let’s live in our lives in harmony. One of my very special guest speakers will be Candace Pollock from the Intentionality Gurus. Candace and I have been hosting a podcast. Candace is a certified Personal Coach, she and I have been working together since March 2018, and I have learned so much about myself and the decisions I make, I have chosen if and what I want to change in my life. Never once did Ms. Pollock suggest or recommend that change was needed. As an intentional guru, I have learned to listen with my head and my gut! Although he may not know it yet, Gary Wenner is another role model that I would like to include in this series. Gary may look like an ordinary man, but Gary has a heart of gold, and common sense to take himself from a depressive state to rekindling love and friendship when most would cower under. Others that will be invited to share with me and you included: Melinda Smith, Katie O’Toole Smith, Katie Kramer, Jenny Bruce, Dorsena Drakeford, Denise Zarella, and another person who not only touched my life but changed it, Lorna Barrett. I have a long list of individuals who will add to this series and maybe one of them includes you. Coaching can be described as a relationship between a Life Coach and client where the coach uses specific skills to help the client achieve agreed upon results. 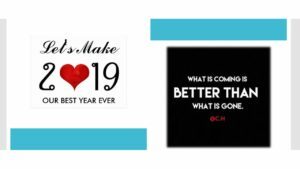 Posted in Entertainment, experience, Life, life changes | Comments Off on Changes for 2019 Join Me!